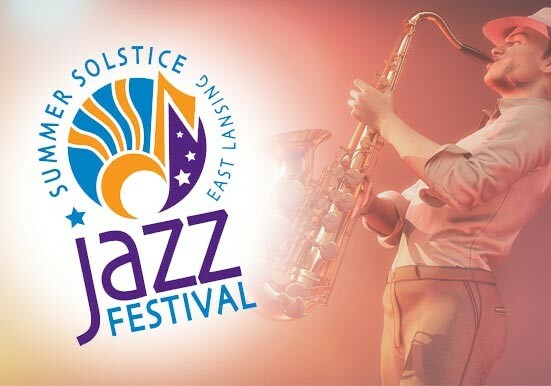 Here Comes the 2017 East Lansing Summer Solstice Jazz Festival! It’s almost time for the East Lansing Summer Solstice Jazz Festival: June 23rd & 24th, 2017. Acclaimed local, regional, national, and even international jazz artists make this free, annual festival one of the season’s first must-attend events! The Summer Solstice Jazz Festival is a free, two-day music festival. Attendees are treated to a variety of excellent jazz, activities, and special events, like the popular Kozmic Picnik & Second Line Parade. The Kozmic Picnik is held on the lawn at the Eli and Edythe Broad Art Museum at MSU on June 24th from noon to 3pm. Attendees are invited to spread out their blankets and enjoy an afternoon picnicking to avant-garde jazz. Musicians for the event are BassDrumBone, percussionist and composer Kahil El Zabar, and tenor saxophonist David Murray. Posted in Events and Festivals | Comments Off on Here Comes the 2017 East Lansing Summer Solstice Jazz Festival!